CNA is thrilled to announce the completion of two classrooms at Nimal Chyat Primary School in Brichet, Darkha VDC, Nepal. This small school serves young children grades K-3. We first met these students in the fall of 2015, as we surveyed Darkha’s schools after the earthquake. These ebullient youngsters ran out of their temporary bamboo classroom to meet the foreigners with big smiles and lots of noise! Our friend Sarda from the UK led the students in a rousing rendition of the song YMCA, much to their delight! Project manager Gopal Tamang met with the school’s principal in early 2017, and decided their needs fit well with Colorado Nepal Alliance’s mission and remaining funds. The school had one building that survived the earthquake relatively unscathed (built by the Japanese Aid agency JICA, it was only 1.5 years old at the time of the quake). The problem, however, is that JICA supplied only two classrooms for a school teaching four grades. These rambunctious young students were separated from each other by only a few pieces of tin sheeting! 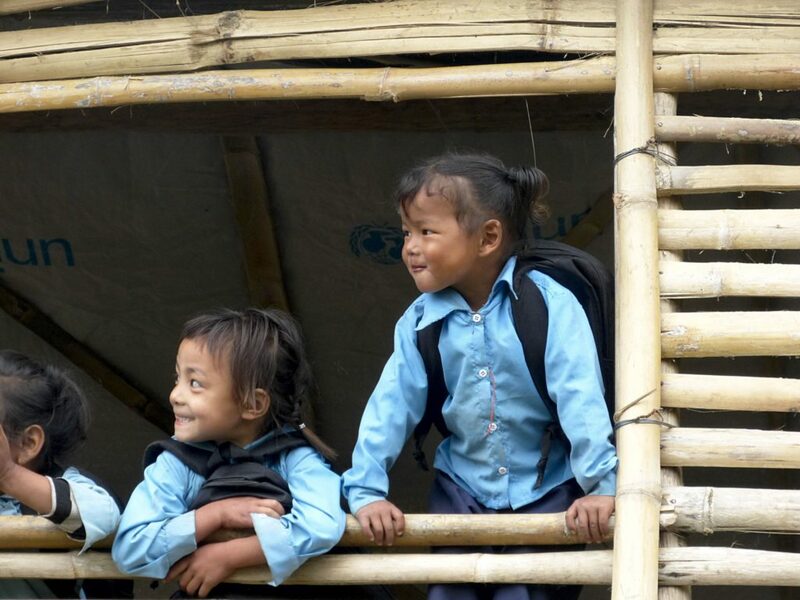 Young students study in a temporary bamboo classroom after the 2015 earthquake. The schools in Darkha VDC were only 13 miles from the earthquake’s epicenter. 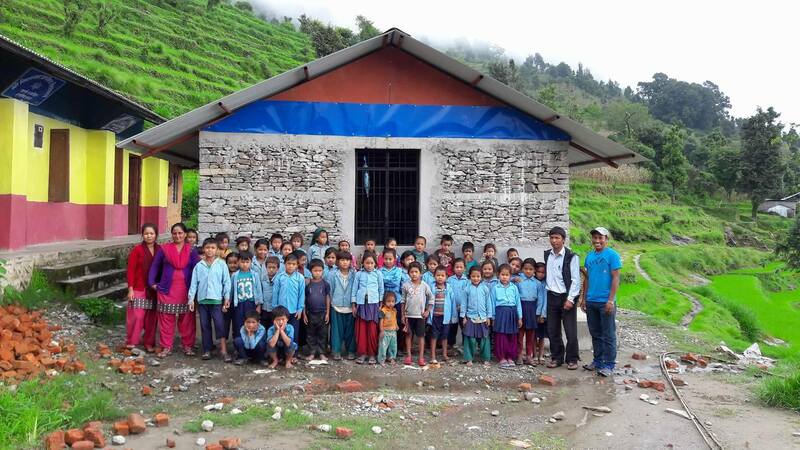 We are pleased to be able to help this school by building two more earthquake-resistant classrooms for them! The community asked us not to use mud plaster on the walls, intending to raise funds themselves for cement plaster. Gopal returned later in the summer to find the students busy inside their new classrooms. Everyone is very happy to have a room of their own!